Let me start off by saying that this is actually my favorite dessert. What’s ironic is I don’t even drink coffee yet I find this so delicious. 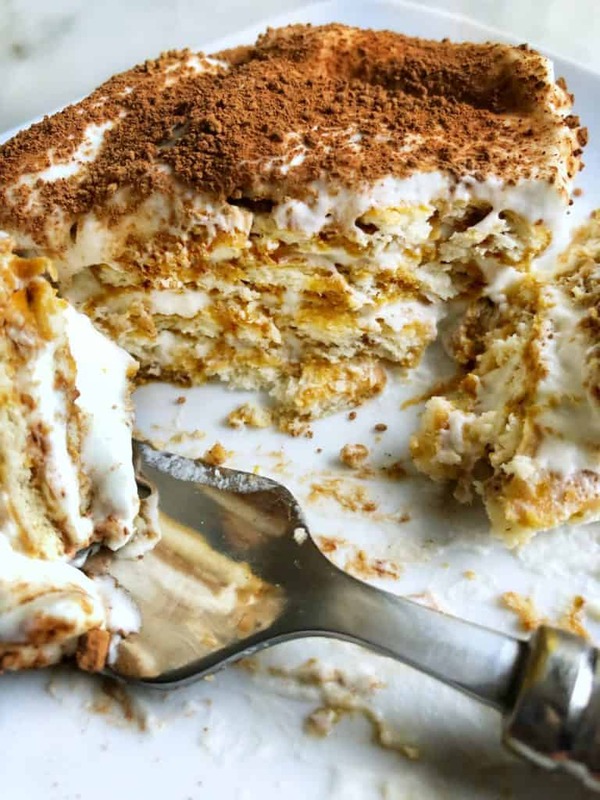 Its very reminiscent of Tiramisu. If you enjoy that then you will definitely enjoy this super delicious no bake dessert. It’s really easy to put together and only requires 6 ingredients. I hope you try this. I promise that you will LOVE IT! Mix the hot water with the Nescafe in a shallow dish. Large enough to dip the tea biscuits in. You can even dip multiple at a time. Whip the heavy cream till you achieve soft peaks. I highly recommend making sure the bowl and whisk are chilled before use. Fold in the condensed milk into the whipped cream and set aside. Have a 9×13 pan next to you. Dip the tea biscuits either 1 or a few at a time for several seconds and then lay flat on the baking dish. Once there is a flat layer of biscuits, top with a thin layer of the whipped cream mixture. Then top with biscuits again followed by cream. Repeat till you reach the top of your baking dish. Normally that is 3 layers of biscuit and 3 layers of cream. The last layer being the cream. Top with cocoa powder by sifting it over the top to cover it completely. Chill overnight or for at least 4 hours. Enjoy! I am so happy that you loved this dessert! I am happy you liked it! It lasts up to 5 days covered well in the fridge. This was sooo easy to make! I only had half a pint of heavy whipping cream so used half the amount of condensed milk and made so much! It’s not too strong of a coffee cake as it balances out with the sweet whipped cream. Great for the entire family. Super simple and delicious. This recipe is amazing! So light and good! It’s super easy to make! The easiest most delectable dessert you will ever have!!!! I make it almost once a month and it’s always a hit! Heifa.. thank you for sharing your beautiful recipes. This Nescafe cake was super easy to make and tasted delicious. 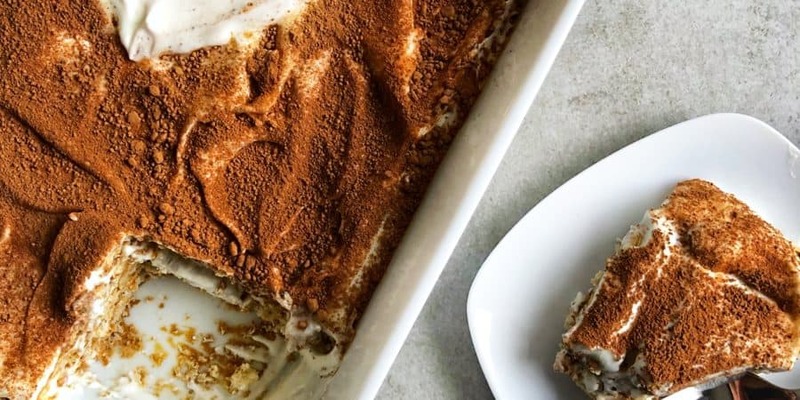 I usually buy tiramisu from Pompi in London all the time.. it’s definitely on par with their taste and texture. Love it! Do you cover it for the initial chill? Amazing amazing! I made this and my family devoured it in one day! I’ve been dreaming of it ever since and plan on making it again soon. It’s definitely a recipe I will keep going to! Made this at home!! It was outstanding and simple! Didn’t need to turn on the oven or stove!